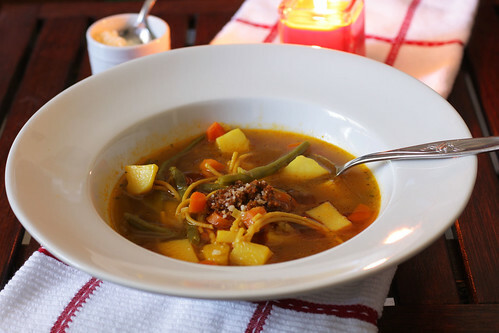 This soup helped me clear my refrigerator of a lot of CSA produce that was hanging out, begging to be used. Well, kind of – I still have most of the produce, it’s just now in soup form. 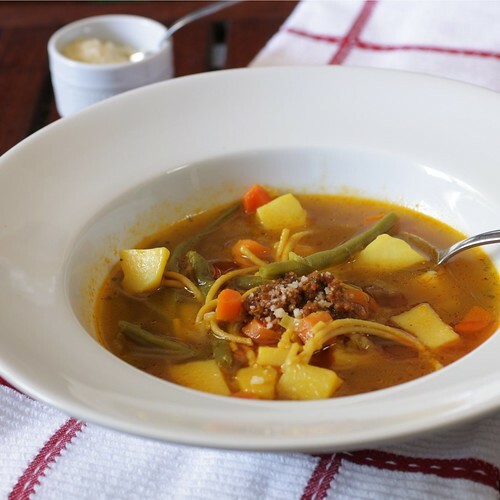 But a lunchtime vegetable soup I can eat all week long sounds good to me! In fact, I’ve still yet to tire of it, and I’ve eaten it several days in a row. 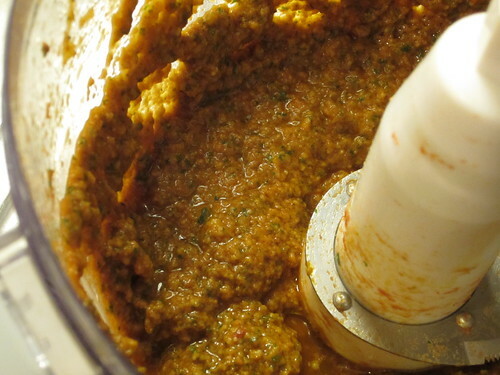 A word of warning – this makes a gigantic batch of soup. Frankly, I don’t know what Ina was thinking when she said it serves 6-8, unless she meant half a dozen football players. I’ve already served 6 bowls, and it seems I’ve barely put a dent in it. I’ve really enjoyed this soup, but I don’t think the pasta really adds anything to the soup, and it makes leftovers problematic because the noodles will just keep absorbing liquid. I solved the noodle problem by dividing the leftovers into 2 large bowls (I told you it makes a big batch! ), straining out the liquid and separating the stock from the veggies and noodles. Then I recombine the amount of each I want when reheating the soup. As I mentioned, going to all that trouble, just for some pasta…not really worth it to me, when the vegetables are the star of the soup. 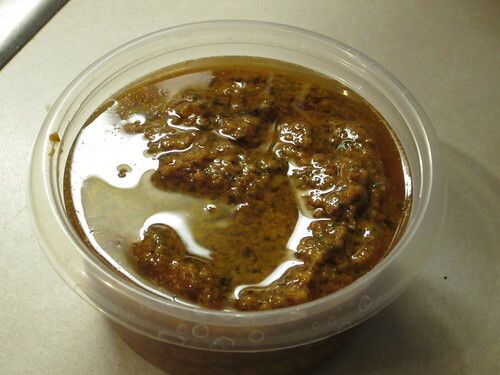 First, make the Pistou (recipe follows), cover in a layer of olive oil to prevent discoloration, and refrigerate. 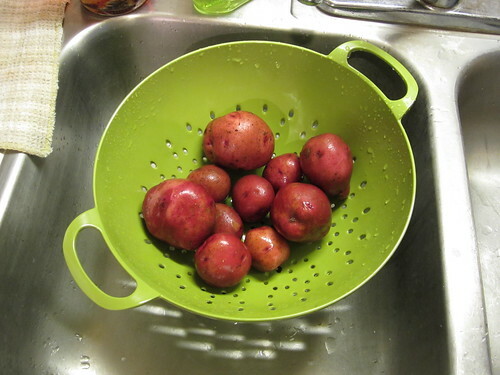 Clean and chop all veggies, placing cut potatoes and leeks in large separate bowls filled with cold water. Be careful not to disturb the leeks, so any sand and/or dirt caught in the leeks will fall to the bottom. Heat olive oil in large Dutch oven or stockpot. Add onions and saute over medium heat until soft, about 10 minutes. 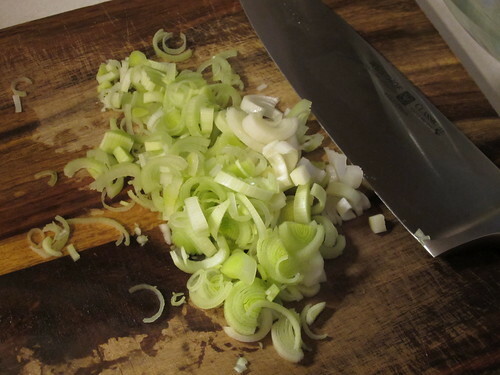 Carefully scoop out leeks from bowl and add to pot. Add potatoes, carrots, salt, and pepper; saute for another 10 minutes. 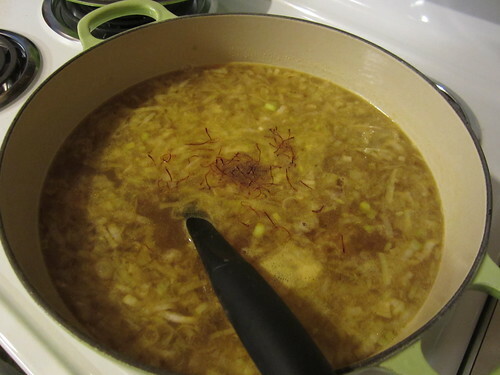 Add stock and saffron, increase heat and bring to a boil, then lower heat and simmer for 30 minutes, or until vegetables are tender. Add haricots verts and spaghetti, simmer for 15 minutes. Whisk in 1/4 cup (60 mL) of Pistou, then check seasoning; add salt and pepper to taste. Serve with a spoonful of Pistou and Parmesan. *Homemade stock is preferred, but you can use your favorite store-bought stock or broth. (I used a combination of homemade stock, Kitchen Basics Chicken Stock, and bouillon with corresponding amount of water.) 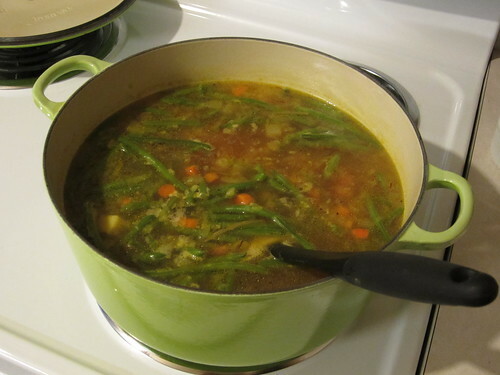 Use vegetable stock for vegetarian soup. **If not serving immediately, hold off on adding haricots verts, spaghetti, and pistou until just before serving. Just before serving, bring to a simmer and add haricots and spaghetti, simmer for 15 minutes, then whisk in the pistou. Also, you can certainly use fresh haricots, trimmed – they’re just not always available here. 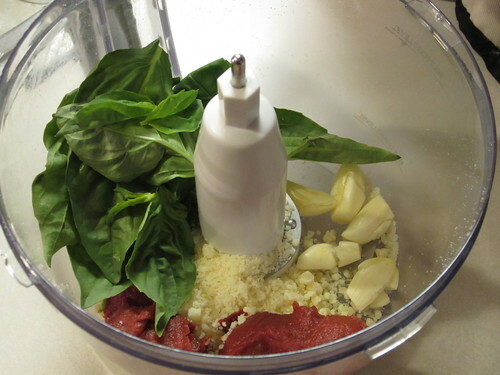 Place garlic, tomato paste, basil, and Parmesan in bowl of food processor. (Use the lower and upper end of ranges based on your taste – for example, I like more garlic, less basil.) Puree with “S” blade. 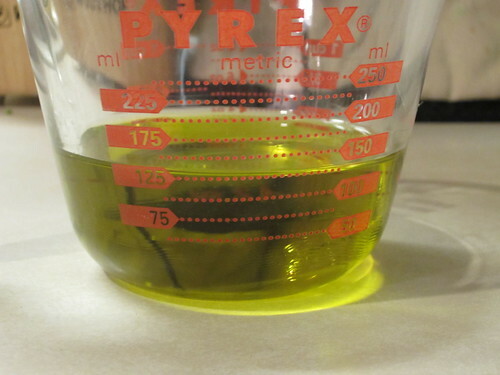 With motor running on low, slowly drizzle in the olive oil. Transfer contents to a container, cover with oil to prevent discoloration. Refrigerate until ready to use, up to 1 week.